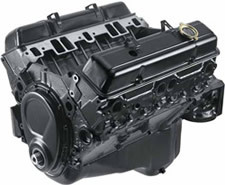 350/290 HP - The best value crate engine in the GM Performance Parts lineup! The 350/290 HP is the most popular GM Performance Parts crate engine because no one can deliver such performance for this kind of value. GM Performance Parts believes that everyone should be able to afford a high quality Chevy crate engine V-8 without going broke. The GM Performance 350/290 is an answer to those car crafters who demand maximum return on their money. But, just because its affordable, don’t think that it’s a stone. The 350/290 delivers 290 hp @ 5100 rpm and a solid 326 lb.-ft. of torque at 3750 rpm. With those kinds of numbers, it’s the perfect replacement chevy crate engine for the millions of GM vehicles that shipped with a small-block. 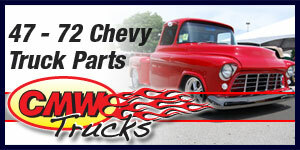 Got a tired, old Chevy that needs a lift? This is the crate engine for you. We’ve also loaded the 350/290 with a four-bolt main bearing block, aluminum pistons, and a hydraulic camshaft. The cast iron cylinder heads are designed to be extremely durable while still providing good airflow through the engine. The 350/290 will ship to you as a Base-level long block. Add an intake manifold, carburetor, ignition system, starter, balancer, and water pump, and you’ll be ready to hit the road with a fresh new motor. All of these parts are available from GM Performance Parts, and with its low price, you’ll have no problem finishing off the 350/290 in style and affordably. For complete list of parts to complement and finish this engine, turn the page. Use internally balanced flexplate P/N 471529 for automatic transmission or flywheel P/N 14085720 for manual transmission (not included). Power ratings based on tests with Holley 600-cfm carburetor P/N 12497147 (not included). Intended for pre-1977 street vehicles and all off-road vehicles. Comes with black-painted valve covers with perimeter-style hold downs; see Valve Covers section on next page for selection of chrome, polished and aluminum valve covers.